You may notice there's a new widget on my blog. I now have a Giving Page on DonorsChoose.org of my very own. I'm not doing this as part of a challenge (although they kind of forced me to join one, weird), I just want to try to pitch in and send some attention to teachers that I think deserve some help for their cool projects. If you aren't familiar with how DonorsChoose.org works let me explain. Teachers post proposals with the help of the DonorsChoose.org people and you go search through them and find ones that you want to donate to. You are donating whatever amount you want to a specific teacher's project. You can sort and filter based on all sorts of things. I chose to focus on Special Needs classrooms that are serving preschool age kids. Once I had put a few of those on my page I got excited and added some more where the total needed is less than $100. That means that your $25 or $50 or $100 (or $5 if you're in a boat like mine) could complete the funding of this proposal and get the materials needed into those kids' hands. So please, take a minute and see if there is something that inspires you. Use my page as a starting off point or just go to DonorsChoose.org and search on your own. I had heard of this website linking donors directly with teachers last year during their Bloggers Challenge. It fell out of my head until I saw an ad on YouData tonight. Go, YouData! This is my contribution to the Message For Obama pool on Flickr. You can search for the tag "messageforobama" to see more. "She's 18 months old and typical. He's 3 years old, has Down syndrome and a heart defect that may require more medical intervention. "I want her to be happy, healthy and independent. I want him to be happy, healthy and independent. "I don't want her to have to take care of him when we are gone. To accomplish our goals we need *your* support. 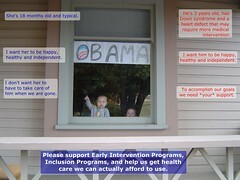 "Please support Early Intervention Programs, Inclusion Programs, and help us get health care we can actually afford to use." Some of us believe that abortion should not be illegal, yet we wouldn't dream of having one ourselves. Some of us do the best we can, make a decent living and then get blindsided with medical bills and a situation that is hard to dig our way out of. Even if I won the lottery and money was never an object for me ever again, I couldn't buy inclusion in our community for my son. That requires the participation of the community in welcoming him in. Don't forget that some of the people that cannot (yet) speak for themselves are not babies that the anti-choice people are trying to speak for, but they are babies that are here, have loving families, and *still* need the help of society. It's nice to finally feel good about the outcome of an election. Thank you for the hope you have kindled in my heart. Wednesday, 11/5/2008, felt like Christmas morning did when I was small. Magical! Way back when I learned about sk*rt from OMSH (you know, Heather, who commented once that she promises never to make me drink any Kool-Aid). Sk*rt eventually became Kirtsy, Heather became an editor, and I just don't go there often. I do get their emails every week or so and I certainly pay attention to contests. Especially contests where they are giving away a free laptop (it's over -- I didn't win). I was curious about this whole YouData thing and went to their site to learn more. Well, the first thing you need to do is fill out some surveys about yourself. I'm a sucker for surveys. Just love giving people my opinion about things. So I signed right up and proceded to survey away. That took no time at all and then I could go look at some ads. Just some cute little banner ads in their ad viewer on the website. Boom, I had earned 25-cents. Not much, but more than I usually bring home. (Why, oh why, don't I get paid for each poopy diaper I change???) So, since it was a lot easier than changing a diaper and they promised to put a shiny quarter in my PayPal account, I was having fun. I clicked thru each banner to the respective advertisers' websites to earn some more change, 15-cents here, 17-cents there. The next thing I knew I had learned about Kiva.org and seen some scary (as in eww, I don't want to dust that) Halloween figurines and some crazy expensive baby furniture. Random surfing could have produced the same results. Pretty soon the kids needed me so I got off the computer. I didn't think about it until a few days later when I got an email from PayPal saying that I've received $3. Huh? Sure enough it's from YouData. Well, thank you! So I instantly go back and view more ads and listen to the happy little ka-ching sound. I am loving YouData.